Wishbone Day: Vietnam has got TALENT! We've just recently learned of Vietnam has got Talent. Look who is rocking the house! What a way to raise awareness! Our good friend Yen Thanh Mac has translated the commentary from the judges. The first judge (Thuy Hanh, MC): Your performance is the most excellent presentation today!!! Your face was so bright !!! I love to see your eyes while you were singing! The second judge (Thanh Loc, Actor): You looked very appealing while you were singing. I like the way you played with your hair during the performance “na, na, na, na”…Wow..You are so charming. You were like a chiropractor helped the hearts of all people in this stadium be revival. The third judge (Huy Tuan, Musician): I believe you were born for being a singer, for performing in front of audiences and your great performance made others be happy! She certainly defies the norms of the quintessential woman despite her handicap. I hope she takes it all the way to the finals. 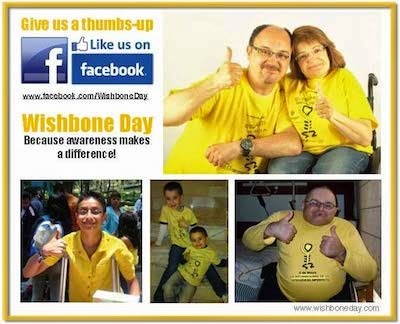 Wishbone Day is a collective STRONG!